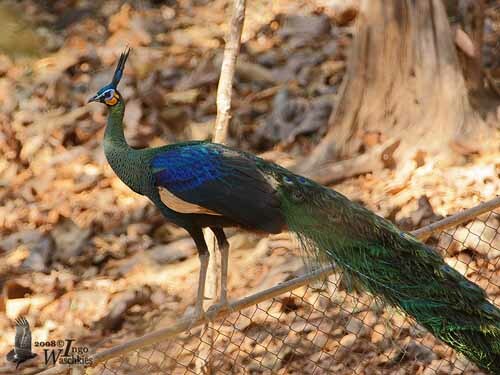 The Green Peafowl is a beautiful bird very similar to the Indian Peafowl (Pavo cristatus), but they do not occur in the same range, and some differences are visible in plumage and head pattern. 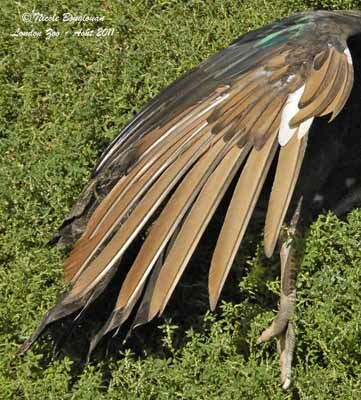 The adult male in breeding plumage has brilliant glossy green upperparts with blackish feathers’ edges giving scaled effect. Shoulders are blue. The flight feathers are blackish-brown, contrasting with the pale buff primaries. The long tail feathers are dark brown. The long train is formed by the uppertail-coverts covered with large colourful ocelli. This train disappears during the post-breeding moult. The underparts are dark brown with green tinge on lower breast and flanks. The neck is long, similar in colour to the upperparts. On the head, we can see a long upright blue-black crest. Forehead and upper crown are glossy blue. The facial skin is pale blue around the eyes. Lores are black. Cheeks are yellow. The bill is blackish-grey. The eyes are dark brown. Long legs and feet are pale flesh. We can see one spur on the rear of the leg of male. The adult female is similar with shorter legs and duller colours. She has blackish-brown tail with pale buff bars. The facial skin is duller than in male. The juvenile resembles adult female but it is duller. The young male needs several stages to get the adult plumage. We can find three subspecies which differ slightly in coloration. P.m. spicifer (possibly extinct), from NE India and SE Bangladesh to NW Burma. This one is dullest, with blacker and bluer upperwing in male. P.m. imperator, from Burma, E through Thailand to S China, Vietnam and Laos. 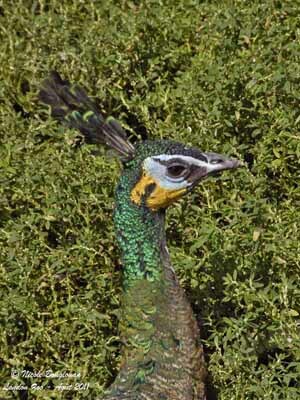 This one is huge, with long neck, glossy green with blackish scales, long crest and long, broad train with large ocelli. P.m. muticus is locally distributed in Java. Probably extinct in Malay Peninsula and Thailand. It is brightest and greenest. 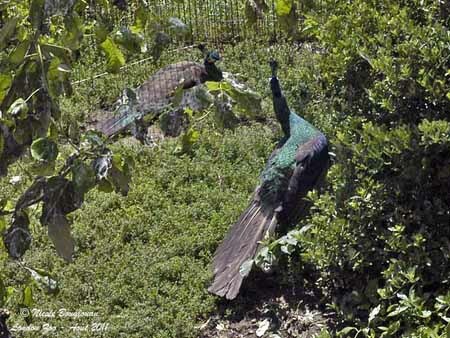 The Green Peafowl male utters very loud territorial calls, a far-carrying “ki-wao” or “yee-ow” repeated several times. The female utters loud “aow-aa” repeated at short intervals. They are fairly vocal at dawn and dusk. 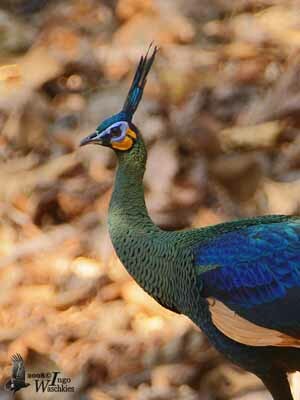 The Green Peafowl is mainly seen in open woodland and forest edges in Java, but it usually avoids the dense rainforest. It frequents the shores of rivers and the bordering wetlands. It occurs from sea-level up to 2000-3000 metres, but more often up to 900-1000 metres of elevation. 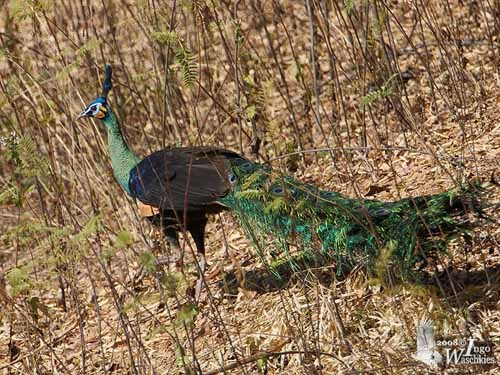 The Green Peafowl is a very shy species, but males can be heard and seen when calling from trees in the early morning and around the roosts at dawn and dusk. This species forages in shallow water, and spends most time on or near the ground, among grasses and sedges. It feeds on fruits and berries, seeds, but also takes insects such as termites, grasshoppers, crickets and moths. It may even hunt venomous snakes, and small aquatic preys are sometimes caught. During the breeding season, the usual display shows the male’s train raised to vertical and broadly fanned. The male displays close to the female, exposing the undertail-coverts when moving. The long train feathers are quivering, that enhances the colourful ocelli. The male is highly territorial and utters loud calls if disturbed. The species appears fairly sedentary in its range, but it wanders widely. 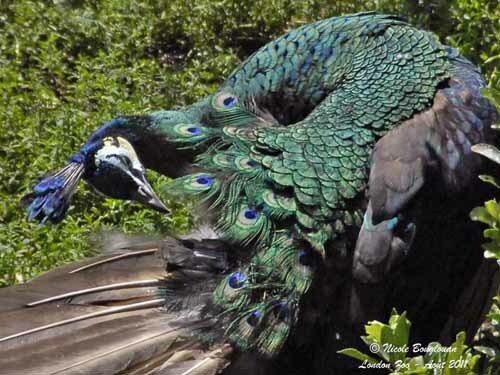 The Green Peafowl is able to perform sustained flight in spite of its large size. 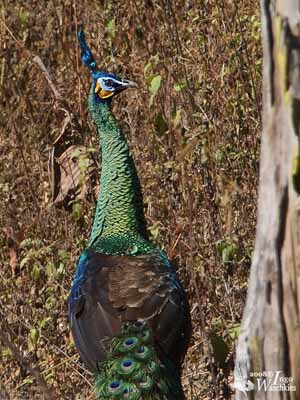 The Green Peafowl nests on the ground, in very well protected site with good view at the surroundings. The female lays 3-8 glossy pale yellow to buff eggs in a lined scrape. She incubates during 26-28 days. The chicks are larger and greyer than those of the Indian Peafowl. They are precocial and leave the nest very soon after hatching. They roost in family groups in trees at 10-15 metres above the ground. The young remain with adults until the next breeding season. They can fly about two weeks after hatching. 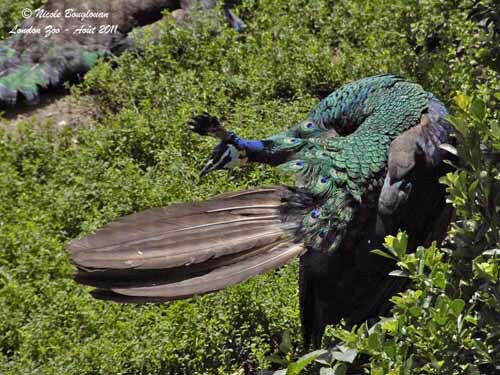 The Green Peafowl feeds on fruits and berries, seeds, invertebrates (grasshoppers, crickets, and moths), reptiles, frogs and other small preys. It may add flower petals, buds and small aquatic animals. It usually forages and wades in shallow water. 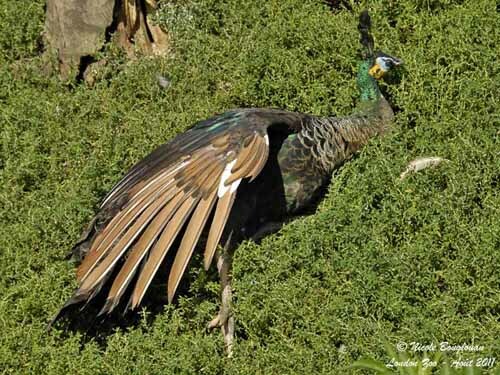 The Green Peafowl is evaluated as Endangered species. It is vulnerable to hunting for meat and feathers, eggs and chick collection, human disturbance and destruction of the habitat. These threats involved large decline. This species occurs in many protected areas in several parts of the range. Some captive breeding programs are already active, in order to reintroduce this superb bird into Malay Peninsula.